Mississauga handyman started as a house painting service back in the early-1970s, working Toronto and Mississauga areas. In this time we were performing mostly commercial and industrial work with the occasional residential painting work. We have painted for high-end homebuilders (custom-built homes) for downtown residential building projects. This is where we learned the high degree of accuracy and skill. is our main service which we excel at. Obviously we know that not everyone needs a super high-end finished paint job that requires much more time and effort to get marginally better results. There is a large difference between a very smooth finish and a ultra highly smooth finish on a piece of wood trim. It takes exponentially more time to acquire a ultra smooth finish that does a smooth finish and that is where the difference lies. 99% of the people that we work for will settle for a smooth finished piece of trim or wall. We have done work where we repaint a single room (in this case it was a study in a multi-million dollar home) where we spent a week in one room going over and over the walls and trim to an unbelievable finish level. It truly was a masterpiece but most people these days aren’t interested and don’t have the finances to afford such an undertaking. The abilities for fine work are there, the cost of painting all the lies in the amount of required effort which means the amount of preparation work required and the application of applying the paint. The more preparation work that is involved and the more time it takes to apply the paint commands the amount of costs of the job. lies in two factors. The first one is the type of paint that is being used which is the most important aspect because if one buys a cheaper paint reducing qualities such as application performance (painting with the material) and the longevity and quality of the material and its performance after application. And secondly the painter himself and his instructions on how to finish the work. If the painter is instructed to slow down and prepare and paint to the highest degree or paint at a regular pace and preparation. You only get what you pay for. is also part of the painter’s arsenal of services. No painter can not have the ability to repair a wall. Many homes have holes from nails that were hanging pictures and places where there are cracks in the walls from structural shifting of the house and places where damages occurred from different sources such as moving furniture around and scratching the wall or someone opening a door too quickly and busting the wall with the doorknob. All these require some drywall repair skills. Just about anyone can put plaster on a wall but the difference is that how the plaster is applied and how it looks in the end. are also one of the benefits some professional painters offer. Quite a few homes need their stucco ceilings repaired and painted. Water damage occurs on the ceiling and the call a house painter that will come out and assess the damage whether it was just a superficial stain which can be sealed and painted over or it is a water damage which has caused the integrity of the stucco and drywall to fail. In this case the painter has to be able to remove the damaged drywall and replace it without making it look as a patch job. This requires skill in being able to make sure that the drywall insert is installed uniformly level to the rest of the ceiling and making it even transition. The drywall has to be then taped plastered and sanded. Finally primed with the quality latex primer and then re-sprayed with stucco popcorn. In some situations the customer no longer likes their stucco ceiling and wants to have it removed. This can be done with a number of different approaches. If the stucco has never been painted before it will be the easiest to remove. A painter that does a lots of stucco removal has the appropriate equipment to remove it quickly with the least amount of mess. If the stucco has been painted though it requires more effort because the paint makes the stucco much harder to work with. Which requires more effort and costs. is performed when the customer has some broken trim such as baseboards that has been chewed up by a dog or the vacuum cleaner hose has ruined the corner of the baseboard. Or possibly something even worse such as a broken doorjamb or broken door caused by a variety of different reasons. Mississauga handyman sometimes is called in for additional work such as installing new crown molding or putting in some bookshelves. 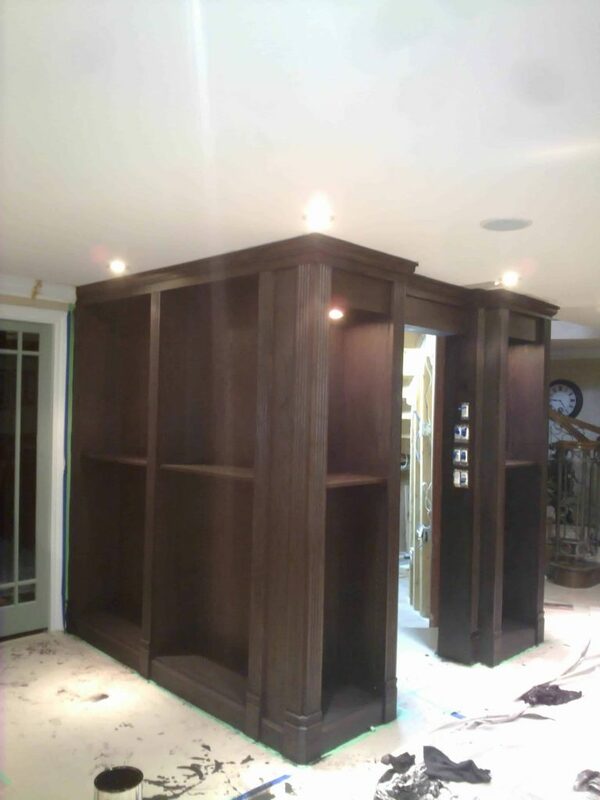 Also our handyman service includes refitting walk-in closets and modernizing them. Removing all the existing shelving and placing in modern updated shelving which is more suitable to use than the older styles of shelving. This is the part of the custom carpentry work that a handyman/painter carpenter can do. in the summer months. In the last 10 years we have been doing more and more wood deck repairs for customers. At first we were just power washing and staining wood decks but then we are asked to repair the occasional boards that were rotting and becoming dangerous to walk on. Later we started rebuilding decks because the condition of the deck was so bad that just have to remove the entire deck down to the bare structure and then rebuild the deck with new boards and railings and steps. Then we would sand the entire deck and then stain it or paint it.